Download and install Droid Transfer on your Windows PC. Get the free Transfer Companion app on your Android, and connect it to your computer (Set Up Guide). 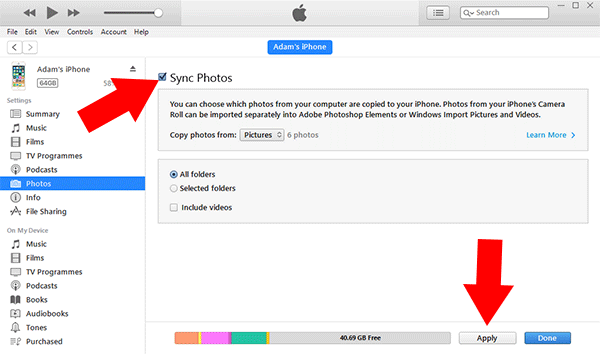 Click 'Copy Photos' to copy all photos, or make a selection first to copy only selected photos. Choose a save location and hit 'OK'. Open iTunes and connect your iPhone. Access the device tab > Photos > check 'Sync Photos'. Choose the folder that you saved your Android pictures to, then click 'Apply' to start the copy. First of all, we need to copy your Android photos to your computer. To do this, download and install Droid Transfer on your computer if you haven't already. You will also need the free Transfer Companion app on your Android phone - This is available on the Google Play Store. Next, connect your Android to Droid Transfer on your PC. You can do this by USB or Wi-Fi. Click the Photos tab in Droid Transfer to view all your Android photos. Hit 'Copy Photos' to copy all your photos, or select multiple photos by holding 'Ctrl' on your keyboard when clicking photos. After clicking 'Copy Photos', select a location to save to, then hit OK to start the copy to your computer. Now that your Android's photos are safe on your computer, you can transfer them to your iPhone. So, connect your iPhone to your computer with a USB cable. If iTunes doesn't open automatically, launch iTunes from your Desktop. 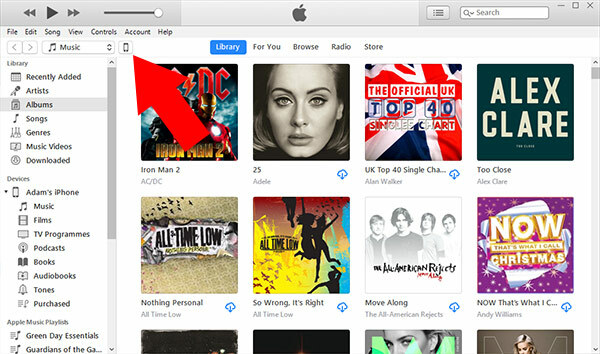 When iTunes detects your iPhone, you will see an icon for your device. Click this icon to access sync options for your iPhone. Hit the 'Photos' tab, and check 'Sync Photos'. 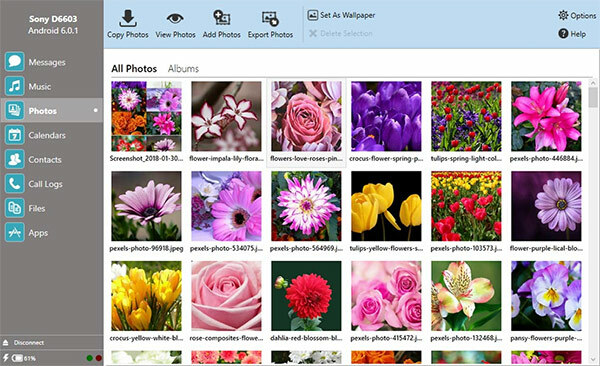 Now you can make selections for what photos to copy from your computer to iPhone, and also whether to include videos. Once you have made your selection, click 'Apply' to start the transfer to your iPhone. Good Job! You have transferred photos from an Android to iPhone.